LAUSANNE, Switzerland – SportAccord Convention is pleased to reveal this year’s MediaAccord programme for SAC2017 with the underlying premise ‘No Sport is Too Big, Or Too Small’. This year’s conference sessions will consider the power of innovative thinking to transform opportunities no matter what size the sports discipline. 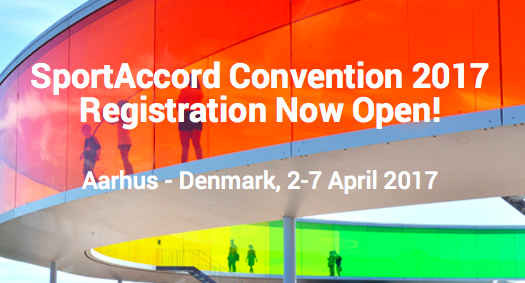 MediaAccord will take place on Wednesday, 5 April from 14.00 – 17.30 at the Scandinavian Center in Aarhus, Denmark, this year’s European Capital of Culture. Kicking off with the Interview of the Day, David Eades, Journalist and Anchor, BBC World will talk to Greg Stremlaw, Head of CBC Sports & General Manager, Olympics, who will share how CBC Sports redirected coverage of the Olympics and Olympians, moving to much more personality-driven content with regard to the athletes and building up their public profiles, so by the time the Olympic Games arrived, Canadians were highly familiar with the athletes and became more passionate in cheering for their success. Commenting on CBC’s strategy, Greg Stremlaw said, “We saw this in both Sochi and in Rio, as the two most watched Olympic Games in Canadian history with 97% and 92% national reach for those events – unprecedented numbers in Canada. A panel session will follow moderated by Rachael Church, Director of Editorial and Communications, World Academy of Sport, entitled ‘Beauty and the Beast … or Happy Families?’ The panel will examine how sports can work with the media to deal with issues of governance and integrity, and consider both practical and more strategic ways of enhancing the relationships with the media to help to tell a better story about sport. Rachael Church will also moderate a further panel session entitled, ‘Ask the Experts’, with a selection of International Federations and media representatives, on what recent innovation is most likely to influence the sport/media relationship in the next year. This year’s Event Watch in MediaAccord will focus on Aarhus who have been nominated as a European Capital of Culture for 2017. Media coverage of Aarhus has been widespread with thousands of articles in circulation, many from leading publications, conveying the passion, innovation and vibrancy of the city in the run-up to the event. Delegates will learn about the approach and how the media teams went about establishing good working relationships with the media during the lead-up to this coveted and major international event. SportAccord Convention is a high profile gathering of key decision-makers focused on the business of sport. The 6-day Convention includes the Plenary Conference, LawAccord, City Forum, and City-to-City.